My lovely friend, Michelle, had an awesome family vacation in Florida where they did it all - beach, Disney World, Lego Land, Sea World, sight seeing... there was a lot packed into one week! I was very honored that she asked me to create an album from their personal photos. 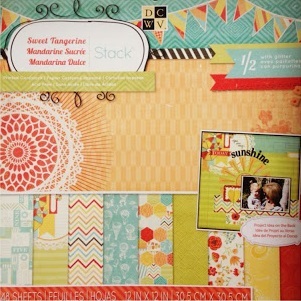 The entire album and most embellishments are papers from DCWV "Sweet Tangerine" stack, with a little bit of banners cut from DCWV "My Sunshine" stack. The colors and patterns are perfect for a Florida scrapbook. Aren't those Sweet Tangerine papers great for a Florida spring break album? Each page was cut from chipboard (cereal boxes!) and decoupaged with patterned paper. I used a basic office supply hole punch and metal rings to hold the album together. The album is wrapped up in lime green tissue paper and a big bow, ready to go home with my friend! I also included two finished blank pages so she can add a couple more photos if she wants. Fingers crossed that she likes it! This is so cute Rachel! I love that you made this out of cereal boxes too! You are so clever! What a great keepsake from your trip! Those papers are perfect for Florida! Love your album! I really like the tone on tone of the month and year on the cover. Beautiful! Oh my, your friend has asked the PERFECT person to make this mini album! I love that you let the photos speak for themselves and added some lovely elements and special touches to the album! And double wow on using the cereal box to make the pages!! You can do it all (and SUPERBLY), Rachel! what an awesome mini album.. fun photos and sweet pages... very cool..